Cities can enhance their competitiveness by improving their urban quality, including aesthetic features and public infrastructures, according to Athens Mayor Dora Bakoyannis. Bakoyannis, 51, the first woman mayor in the history of one of Europe's oldest cities, said urban development strategies aimed at beautifying Athens ahead of the 2004 Olympic Games have had a significant impact on the city's competitiveness and attractiveness. ``To confront economic, environmental and cultural degradation in metropolitan areas, there is a need to update urban management and planning, transforming these areas into strong, decentralized economic entities with access to global markets,'' Bakoyannis told The Korea Times. She was taking part in the Seoul World Mayors Forum at the Lotte Hotel in downtown Seoul yesterday. ``As the mayor of Athens, my two biggest challenges were giving the aging city a facelift ahead of the 2004 Olympics and upgrading its outdated public transportation system. Through the process, Athens has made important progress in solving many of its major problems, especially in urban environment and transportation,'' she said. Bakoyannis was elected mayor at the beginning of 2003 with the largest majority in the history of modern Greece. During her tenure, she led Athens on its costly preparations for last year's Summer Olympics, which gave the 3,500-year-old city a more modern image. The preparations, spanned out through an investment of $130 million, included renovating and remodeling 277 major streets, cleaning and repainting the facades of 3,000 old buildings and redeveloping the city's green spaces. Another 1,300 buildings are on the city's renovation list for 2006. The city also spent over $3 billion expanding its metro system, from 25 kilometers in 1999 to 75 kilometers in 2004. ``Our face-lifting efforts had direct economic results, with a steady increase in direct foreign investment and a 16 percent increase in tourists compared to the pre-Olympic days,'' she said. Bakoyannis said her city is expects to strengthen its ties with the Seoul Metropolitan Government to share ideas and experience for improving urban development strategies. The Athens city government is expected to sign a protocol with the Seoul city government today, ensuring future cooperation in developing policies for public transportation, deploying information-technology services and improving cultural environments. ``This will mark a starting point for both cities to strengthen cooperation in a variety of fields in the future. We believe that the alliance will have immediate results in the cultural sector,���� she said. Bakoyannis said further developing Athens' mass transit system is a difficult challenge because the city is full of historical and cultural assets. The Greek mayor said she was impressed by Seoul's recent revamping of its public transportation system, which strengthened the role of buses by making routes more direct and by simplifying fares. ``Improving mass transit is a difficult challenge in Athens, as every time we dig to build more Metro lines, some hidden marvel comes up,'' Bakoyannis joked. ``There will be lots of ideas and experiences to share with Seoul in both large-scale urban development strategies and in the details of effectively deploying those plans,'' she said. Bakoyannis is the daughter of a former prime minister, Constantine Mitsotakis, who fled Greece's military dictatorship in the 1960s, taking his family into exile in France. She is also the widow of former Greek lawmaker Pavlos Bakoyannis, her first husband, who was assassinated by terrorists in 1989. 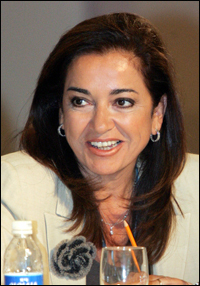 Bokayannis, who had spearheaded the public fight against terrorism in Greece in her years in the Parliament, survived an assassination attempt in 2002 shortly after she was elected mayor of Athens.